I am back. Happy to be home, well rested, feeling cooler than the temps outside. Holding all of the deep lush green forest damp in my heart. Tomorrow is my last day at the Farmers Market in Memphis. I'm not sure if it's the last ever, but it will be the last this year. If you're in the notion, come and find me and say hello. Leaving the market was a difficult decision, but I can't keep and build inventory and hold on to my wholesale accounts or manage to stock an online store. So I'm dropping my obligations there and seeing what will happen in other areas. I'll have some mugs, some honey pots, a few berry bowls, and a precious few bee pieces. While we were away in the Smoky Mountains my new clear glazes arrived. I'm excited to try them. And shortly before we left I restocked my wares at Original Ink in Germantown, TN. I am so happy to be with the ladies who run this lovely stationery and gift shop- they have so many nice gifts for babies, small children, and a growing selection of gifts that would be just wonderful for hostess and birthday gifts. 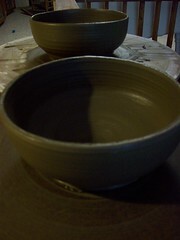 Next week I'm planning to do more glazing and firing and restocking. Have a nice weekend, y'all. Stay cool! Happy Fat Tuesday, everyone! I've been up early after a long day yesterday. Thinking a lot about the past, right now, and carrying on tomorrow. I took this picture this morning for friends who are still locked up in cold and snow- trying to give them a glimpse of spring that is surely coming (and in return, I'm asking for deep summer pictures of shade and cool streams when I'm sweltering in the sauna that is Memphis in late summer). I've kept politics out of this space, but I am a very political person. I've jumped around a bit where I stand on many different issues, but I believe that we can affect the changes we want to see. I have been very involved recently in a local issue. This morning, thinking about the past and future, my family and I encouraged other parents and voters in Memphis to vote in today's referendum to combine the city and county school districts. There has been so much division in my community for too long- divisions over race, income levels, education, geography. I try to never speak ill of Memphis- I love it, but it is like a dysfunctional family. After I heard the NPR piece yesterday morning, I felt physically ill. This situation is a mess, but ignoring it and maintaining separate school systems won't fix our problems. If you're reading this and you live in Memphis, please go out and vote YES today. The schools need serious reforms, but voting to maintain the status quo will only serve to further marginalize children who are already at risk. So, appropriate that voting day is on Fat Tuesday, the day before Lent begins. For many people, Lent is about giving something up. Deprivation is pretty easy for me- grace and beginning again are harder. This year, as in years past, I'm taking on the habit of gratitude. And after spending 10 hours yesterday glazing pottery and pushing myself too hard, I'm also going to work on being kinder and more gentle with myself. A bit more Grace for Me. And by extension, grace and gentleness for those around me. 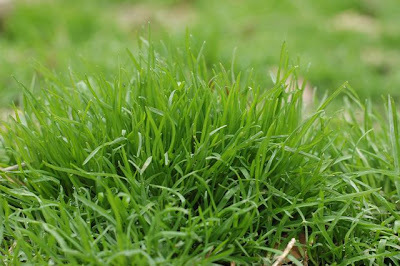 Lent is a time for preparation; Spring is coming, it's time to begin anew. Tomorrow, no matter how the election is decided, Memphis will begin preparing its children and its schools for the future. I hope we'll be unified. I resolve to be grateful that we were given an opportunity to decide and grateful that the will of the people will prevail. More pottery talk later this week. I'll keep the rest of my political opinions to myself. Hello, March! So happy to see you! Sunshine, warmer temps- spring has come to Memphis. We'll probably have one more freeze, but I've drug my bay tree out into the yard and will drag it back into the house if it gets too cold. The daffs are popping up, and the gorgeous Japanese magnolias and cherry trees are coloring up front yards like giant pink lollipops. March is almost always a busy month for me- it is officially time to get busy building inventory, and a friend who managed the market sales for a local orchard with strawberry fields reminded me that strawberries will start coming in at the end of April. Which means one thing: berry bowls. I'm making fewer of these this year because I'm getting tired of them, but I don't think I'll stop completely. I've been making honeypots by the dozen, both to build inventory and to put up in my neglected shop. Starting Thursday I'll be making one. thousand. herb markers for a local event put on by the master gardeners- and hopefully that will be enough to last me through the summer. One. Thousand. That will be about 100 of each herb that I do. I'm getting help for this one- from the making to the glazing to the cutting copper stakes, my friend Natalie is my right hand gal. Our farmers market starts back up in mid-April; it is serious inventory time! Today was a lovely day- a cool morning- frosty, even, cold enough that someone was kind enough to build a fire while his family was still sleeping- and now warm enough that laundry is out drying on the line. I saw a honeybee while I was hanging the laundry (I bough the new Ashley English Keeping Bees as an early birthday gift to myself, btw. Look for bee posts in another 2-3 years), and I am making a double batch of Olive Oil Granola (Don't let the name put you off. It is the best granola I've ever made. I cut the maple syrup down to 1/2 c and left out the brown sugar entirely) as I type. I hope you're beginning to see signs of spring where you are, too. What a weekend. It's hot like August right now and has been for almost a full week- high in the mid-to-upper 90s, high humidity. Now I like, even love our humidity. But at this temperature, the humidity means we have heat indices in the 100s. I've been craving some time in a cool forest, in running water. A respite. We had a very busy weekend - I had my day at the farmers market and we hosted our bookclub that evening. I'd planned to spend Sunday on the Mississippi River to have a day of cool and quiet. It turned out that we needed the respite as Sunday began rather traumatically. I got up early, as I usually do, and let the chickens out as the coffee was brewing. There were only three. There were signs of a scuffle in the hen house. There were feathers outside everwhere. And then, to top it off, there was crowing. Quite a lot of crowing. Mary, a well-mannered black star hen, served as supper for the neighborhood raccoons. They ripped out the screening in the back of the hen house and I can only imagine what followed. And Petunia let us know for sure that she is not a she. We were devastated at the loss of our hen and disappointed to learn for sure that we owned a rooster. It was hot, it was humid, and we had a loud carnage scene to deal with. Respite, we doubly needed you, even though we knew we'd return home to the task of re-building and reinforcing our hen house. We are fortunate to have a great state park, locally known simply as Shelby Forest less than 20 miles from our front door. It is so densely forested that a) the temperature is 10-15 degrees cooler there than in the city and b) our cell phones don't work in the park. There are two lakes, miles of hiking trails, and when the river is low enough (and it wasn't this time), sandbars to play "beach" on. Central to this artisan's interests, vast pockets of iron-rich sandy black clay line the sandbars and boat access ramps. We played in the water for a bit, dug a bit of clay, picnicked in the shade near one of the lakes and rested for a good part of the day. It was deep green, cool, breezy. Full of wildflowers and vast glades of ferns. I'm still so sad about our chickens (plural because Petunia will need to find a new home- crowing roosters aren't popular with city neighbors), but I am glad that we went to the river as we'd planned. It was a beautiful, peaceful place. Good morning! I hope you're well and that Friday day starts your weekend off on a good note. I'm finishing up some glazing today- yesterday my glaze assistant came and put in a good three hours of mixing, cleaning/prep, and dipping my pieces for me while I painted ferns on a bunch of mugs, bowls, and serving pieces. I am so so grateful to have such a meticulous helper who does the work I'm less crazy about so I can focus on the details. Today I have a few ladybug pieces left to finish and several dozen pieces to speckle before loading the kiln and firing it. I'd also like to put some time in the studio at the wheel, but the garden's been singing a siren song and I find myself whiling away the hours pulling weeds, moving plants that have outgrown their space, turning compost and generally working my way back to peace puttering in the garden. I took this photo on Wednesday- I swung by the produce store to get some things for a fish taco supper we'd been planning and could. not. resist. the cherries. So so good. These days most of our produce is local- like these beet greens beside the bowl- I used local onions, baby turnips and their greens, beet greens and swiss chard, local bacon and new potatoes from our CSA with some farm fresh eggs from my favorite dairy farm to make a hash (cooked veggies and a tiny bit of meat with eggs fried (more like steamed, in our case) on top, served with brown rice. I can take any normally-refused vegetable and serve it this way and my family will eat it. There are never leftovers. So many of our meals look like this- 90% or more local produce, supplemented occasionally with non-local avocados, mangoes, grapes, or a cherry splurge. Eating local has become a habit for us. So much so that I'm not planning to do the One Local Summer challenge this year. This week I've had a delicious raw beet and carrot salad with feta for lunch almost every day. All of the ingredients except for the olive oil, salt, and lemon juice came from the farmers market (where beets were $1 for a tray of 3 or 4. I'll be buying more tomorrow!). The lemon juice was a gift (in the form of a 15 lb box of lemons!) from a friend. The little meat (but sadly, not the fish, and I'll admit to hoarding gulf shrimp, which is as local as I can get) that we eat (or rather, that the boys eat, I'm still on fish but nothing else) is local and mostly organic and humanely raised and processed. We're still eating the last of the beef and pork I bought last summer. OK. So, enough food and garden talk for now. I hope by the end of the weekend to have another batch of berry bowls up in the shop. Y'all have a lovely weekend! Until the Memphis Farmers Market opens its season. I've spent this week finishing my first batch of herb markers for it and the Trolley Stop Market, glazing and firing ware, tinkering with the layout of this blog (that was a wasted afternoon. I crashed it and spent 4 hours getting it back into shape), throwing, trimming, and reaching the point that I always do before a big event or season of feeling completely overwhelmed. The house is a wreck, the lawn needs mowing, laundry has morphed into a mountain of needs-to-be-done and needs-to-be-folded. Instead of flipping out like I usually do, I'm stopping. It's Friday night. My kiln is loaded with the last of what I'll take to the Market next Saturday. I'll glaze it on Monday. Since I'll be there every other week until the end of October, there's really no sense in my trying to have everything all at once, is there? I am happy that I have enough to fill my shelves, with more on the way. In my basement, on the photo table, I have almost a dozen of my "hope" vases and bowls. I plan to shoot and list them Sunday or so. 60% of their sale price will go to support St. Vincent's Orphanage, Hospital, and School in Port-au-Prince, Haiti, via West TN Haiti Partnership. I'll let y'all know when they're up on etsy. There are also about 15 berry bowls down there, ready to go. I think that I'm not taking orders on these this year, I'll just list them as I have them. In years past I've made myself (and my family) quite nuts trying to make them as quickly as I could, breaking many of them, not being able to fire because we lost power for a week due to a freak summer thunderstorm. This seems to be how I operate- over-commit and make everyone at my house crazy. Not this year. I'll have what I have. This photo has nothing to do with any of this, really, except that my friend Melissa called me around lunchtime to let me know that she had lots of ferns popping up and that I should come get some. So I did. A bouquet full of fiddleheads sure makes me happy. I also stopped at a house in my neighborhood with a glorious bed of tall ferns that grow happily in the sun (you might imagine that this is a rare thing) to ask if I could have a piece of the plant. The nice lady of the house told me that the fern escapes into the yard and that I could dig all that I wanted. I plan to head over tomorrow with a shovel. I hope you all have a lovely weekend. 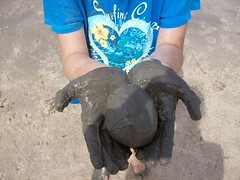 And I appreciate that you are reading what I have to say about my pottery, garden, and life. Thanks for your thoughts and support. In another week I'm going to be participating in a collective holiday sale called "Deck the Halls," located in East Memphis, and put on by my friend Lisa Williamson. Lisa is an incredible woman- I met her last year when her eldest daughter was in my son's pre-k class. She is an artist, a women's running coach, and she is putting together an interactive art museum for children and adults called the Junkyard. They're currently scouting for a location and the whole city is abuzz about its potential. Oh, and thank you all so much for your support for my etsy shop. I'm adding a few more pieces this week- some mugs and the next batch of berry bowls late this week. I hope you're having a beautiful weekend! My first day at the 2009 Memphis Farmers Market was excellent. Really, really excellent. Beautiful day, happy customers, happy friends, good brisk sales. I know I've told you before about Peace Bee Farm, my very favorite honey people, and I believe I mentioned Richard's blog, Peace Bee Farmer. Richard, Rita, and Wes Underhill will also be at the Memphis Botanic Gardens farmers market, which opens this Wednesday, April 28. They will be carrying a small selection of my honeypots! I'm really excited because the Wednesday market reaches a different segment of Memphis and I'm just not able to do both. Also, I'm excited because I just love the Underhills. I hope the rest of your weekend is just wonderful- I have been awake since 4:45 this morning, and I am looking forward to a short nap before the evening begins. ** Sunday morning edit- if you're looking for honey dippers, there are a variety online, but I get mine from Casey's. They have lots of cool wood items- toys, waldorf and montessori-style children's utensils, toys, and, um, components (for lack of a better word). Great prices, they take paypal, and I want to say that they're all made in Maine, but I can't back that up 100%. I'm going to make another order from them for my Catechesis atrium soon. Yesterday was the first day of the Memphis Farmers Market. It really was like a country church old home day. Lots of hugs and good wishes and squeals and "good to see you"s. Have I told you about my MOST favorite vendor? It is Jim Tanner, my "goat cheese man," from whom I buy my eggs. I didn't hold out much hope that I'd be able to get eggs yesterday since I didn't get to the market until 8 and Jim usually sells out by 7:15. You can't imagine my delight when he opened up his egg cooler (It is easily 3.5' to 4' long) and it was still full. Last year I'd make a point to get to the market before 7 (when I work the market I arrive at 6, when I shop, 6:55) JUST to be sure I'd get eggs. I asked what had happened- one customer "blamed" the rain. Jim's simple answer: "I got more chickens." Jill and Keith, my "favorite" farmers in charge of Whitton Farms were in full force with their veggies, flowers, and transplants. I got baby garlic in my CSA bag and impulsively planted them all last night before the rain started, in hopes that I'd be able to finish the season with good heads of garlic. 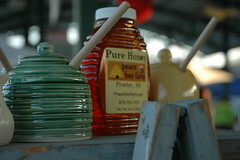 I was just tickled to learn that my favorite honey producers will now be at MFM EVERY week. Richard and Rita Underhill of Peace Bee Farm are such wonderful people, and Richard is blogging about honey and their farm at Peace Bee Farmer. Lastly, well, not lastly, but for *right now*, my friends Guion and Jeremy Benkin have started a great little company called Re-Hy. They recycle glass bottles into lovely drinking bottles, dish soap dispensers, and cruets by adding etched designs and metal tops. The Benkins are lovely people (aren't all crafters, really?) who are so excited about this venture. They, like me, will be at the market periodically. My first week at the market is this coming saturday. I am excited and have a lot of work to finish up. It will be a busy week this week, but a good one, I think. I hope you all have a beautiful Sunday and a beautiful spring week! Tiffany asked about this bottletree, so I thought I'd properly introduce it. This particular bottletree was a gift to me from Gary for our first married christmas. He made it out of hose clamps and cable wire, sunk in concrete in an old galvanized bucket. It sat in our side yard at our old house (that's where this photo was snapped), where you could see it from the road. 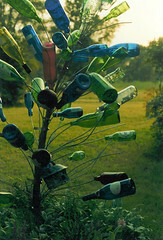 Bottletrees are a Southern thing, specifically a Mississippi thing, but interest in using them as a decorative garden element is spreading. Originally, it was thought that the decorative, colorful glass bottles would attract and catch evil spirits (the wind whistling in the bottles made folks think of "haints."). I love mine- the bottles are mostly blue, red, turquoise (including some old glass telephone pole insulators), with some good greens thrown in for good measure. Right now our camellia/rose bush (they grow together and are 12' tall, 10' in diameter) are hiding it from my view, so I'll need to move it this fall when my garden beds get a good de-thugging. Sometimes people use 5" posts with dowels inserted to hold their bottles. Other people use old defoliated christmas trees as a base. It's rare to find real trees used, but sometimes you can find them. I've never had a bottle break in the winter, though if the pot's not sunk the spring winds will sent the whole thing crashing to the ground. We've gotten away from using wine bottles unless they're cool and swirly like last week's asti bottle, but beer, saki, and water bottles are fair game (mostly because of their smaller size). Eventually I'd like to put another smaller one in the front yard (what will the neighbors say???? ), but I need a little fence around the front garden before I'll be comfortable with that. Cool folk tradition, now mostly practiced by yuppie/hipsters. Not that I'm including myself in either of those categories. I just signed on to "one local summer," sponsored by Farm to Philly. I pledge to make at least one meal a week from all local ingredients (excluding olive oil, salt, pepper, spices)and share the results with you. Sign-up for this project ends on Sunday, May 25. We have a couple of marvelous farmers markets in Memphis- I hope that this will prompt me to visit them more often. I LOVE them, especially the downtown Memphis Farmers Market, but there is another one way out east at the Agricenter, and a mid-week market at the Botanic Gardens. Between those and my own little garden, this should be a snap. Summer begins for us this evening- today is little boy's last day of school- so I'm excited to begin the summer with a plan for our table. In my own garden, the swiss chard is ready to pick, arugula has reseeded everywhere. The kale and cabbage are on their way out, but my potatoes and tomatoes, herbs, and beans are starting to fill in. A customer on etsy special-ordered some vegetable markers, so I bought some zucchini plants (just two!) for their leaves and to try in the garden. Despite zucchini's reputation, I've never had luck growing it, but we'll see how it goes this year. Potatoes were a bust in 2007-I had a sum total of five marble-sized potatoes, but I'm hopeful that this year's crop will be more substantial. Whether growing the veggies and baking the bread myself, or finding them at the farmers markets, I'm looking forward to a delicious summer! one of my julep cups. Obviously used, it had some coffee (or maybe juleps!) stains at the rim. It was marked 50 cents. And it was half-off. I grabbed it. When I was paying for my haul, I told the manager (um, we're on a first-name basis. I really like this store) that this was mine. She (and the rest of the store listening in) didn't quite understand, but I clarified: "I MADE this. With my own two hands!" They all wanted to know what I'd do with it, and I thought about cleaning it up and putting my normal $8 price on it (because it certainly costs more than a quarter to make! 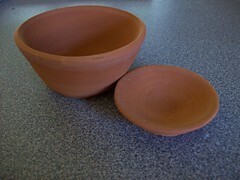 ), but I think I'm going to keep it as a "vintage" bridgman pottery piece. My new cups are a little more slender and I've changed my glaze formulations, so it wouldn't work as a set. Gary asked me if I was upset to find it for so little at a thrift store. Honestly, not really. I give things away all the time. This store is part of one of the Memphis women's charity leagues, so it may have been a gift that didn't quite fit, or part of a set that broke. Really, I was pleased to have found it and that it made its way back home to me.